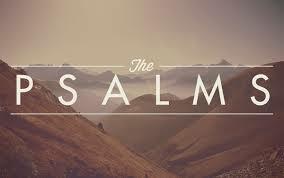 Do You Have a Favorite Psalm? On Tuesday, we’ll ask you to share your favorite Psalm. With 150 of them to choose from, there has to be at least one, perhaps many, that have been meaningful in your life. There are Psalms for every occasion, whether you’re up, down, happy, sad, repentant, joyful, exultant – you name it! I (Jerry) have so many personal favorites. One is Psalm 37, where God promises to give to the one who trusts in Him the desires of his heart (verse 4). Or Psalm 51, the great cry of David for mercy, which I have prayed on so many occasions. I could also mention Psalm 139, a great meditation for anyone seeking to better understand the intimate relationship we share with God. So, what’s your take on the Psalms? How has this or that Psalm lifted your spirits during your life or been a companion to you during times of trial? I suggest you call early on Tuesday, as the lines are going to be filled with great listeners like you sharing their favorite Psalms! I just stumbled onto this page – I thought it might be okay to refer to my Psalm project. I’m putting the Psalms to contemporary music suitable for congregational singing.